Dear Y99 chat users, this post has been created as a quick guide to some useful settings or you can say some Y99 life hacks. As we all know, Y99 Chat is a free chat platform which allows anonymous guest users to participate in chat. Due to this reason you might be receiving unwanted messages from strangers. To prevent those strange messages from appearing in your inbox, you can do as indicated in the picture below. First, tap Messages button on bottom bar, then tap the settings icon on bottom right. 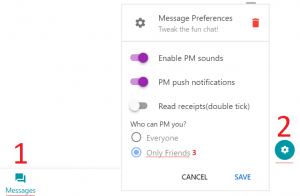 A popup will appear in it, choose “Only Friends” option for the question “Who can PM you?”. This will make sure only those users who are in your friend list can send you private messages. First, tap on three lines icon, then tap Profile button in the panel that appears. A full-screen dialog box will open. 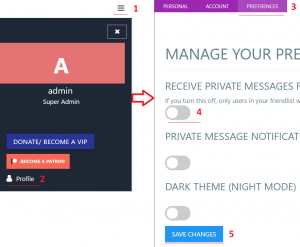 Now goto Preferences tab and switch off the first switch which says “Receive private messages from public”. Recent private messages list shows you a list of users who have communicated with you recently. If you wish to clear all of them in one shot, you simply have to do as shown in the image below. Press the messages button on bottom bar, then press the settings icon at the bottom right and press the red color trash bin icon. Doing this will clear your recent message history. Note: This feature was introduced in New Design so there’s no way to do it in the old design.